Regarding Democratic City Central Committee not opposing segregation in St. Louis. Secretary to the President, White House, Washington D.C. The Democratic City Central Committee has failed to take a stand against the measure to segregate the negroes of this city, to be voted on February twenty-ninth. The National Convention is to be held in June. The inaction of the Central Committee may cause segregation. The National Committee should not be placed in an embarrassing position. Can you realize the importance of this inaction. John P. Herrmann. Now that the yellow peril in Congress has passed, I confirm my telegram. The segregation question like prohibition is a local question until it becomes a national question. The inaction of the local central committee will now cause the matter to come before the national democratic convention, unless we have a federal decision prior to that time nullifying the act. I am glad that the hysteria in Congress has been gored. 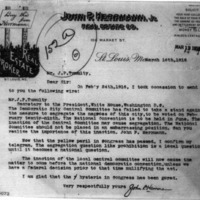 Herrmann, John P., “John P. Herrmann to Joseph P. Tumulty,” 1916 March 10, CS95, Race and Segregation Collection, Woodrow Wilson Presidential Library & Museum, Staunton, Virginia.